We love making our food from scratch, knowing what goes in to our food and enjoying the tweaking process to perfect a recipe. I had never attempted a pizza base though... dough kind of scares me. Itay made some pitot (plural of pita) a while ago, which were semi-successful. But hard! So, an easy two ingredient pizza base. This one has been going around the interwebs, but I thought - seriously, just two ingredients? 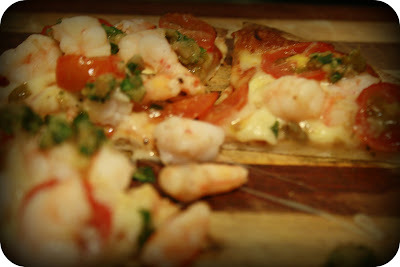 Then I found a pizza recipe named something like "Best Ever Chilli Prawn Pizza" and it sounded so good, I thought I should have a go at this home made base business. 1 cup youghurt - natural or Greek. Mix. It stuck to my hands furiously and I panicked. Added more flour. and then added more. And it began to come together. I added a little more and then began to knead. And it worked! I rolled it out and then just loved myself like crazy. I made a pizza base! Salsa verde - basil, parsley, stale bread, olive oil, anchovies and capers whizzed up. Agggh, terrible photo. Anyway, it was divine and super easy! I'm too scared to make my own pizza dough as well so my other half gets that job while I chop up all the toppings. Makes a world of difference though doesnt it your own pizzas totally from scratch yum!